Outdoor cooking is an extremely common practice in a number of countries all over the world, especially those near the Mediterranean, and it’s becoming more and more popular among homeowners here in the Toronto area with every passing year as well. While having a nice grill and a patio or driveway area to fire it up can be nice, that kind of setup can never provide you with the same level of convenience and comfort that a fully-functioning outdoor kitchen space can provide. Outdoor kitchens are becoming a more popular feature among homeowners year after year, and if you’ve never considered all the benefits a brand new outdoor kitchen could provide to your home, now might be the time to start looking. To help you in this task, our team of skilled Toronto hardscaping contractors has taken the time to put together this short list highlighting just a few of the many reasons that a brand new outdoor kitchen space could be a wonderful investment for your home. One of the biggest benefits of adding an outdoor kitchen space to your home is that it helps create the perfect outdoor entertaining space. 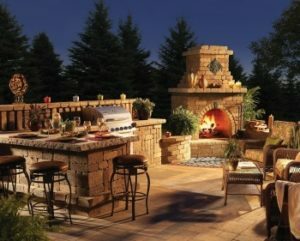 While it’s possible to congregate around the grill during the cookout, outdoor kitchen areas provide you with a wide open area for your guests to gather, and thanks to features like patio seating and full, outdoor dining areas, none of your guests will have to fight for seating on top of your coolers. This creates a much more pleasant and comfortable outdoor dining experience for everyone involved. One of the most popular reasons for any home improvement project is the additional value they can bring to your home, and outdoor kitchens are no exception. As well as providing your home with a significant aesthetic boost, an outdoor kitchen gives you a great deal of functional flexibility as well, and can prove to be a big selling point if you ever go to list your home. As anyone who does a great deal of cooking can tell you, the kitchen can get hot when you have all of your appliances going, and most often, your air conditioning system is going to go into overdrive in order to compensate, especially during the hot summer months. With an outdoor kitchen, however, you can spare your air conditioning system the additional strain by moving your cooking outside, where your cooking appliances won’t affect the comfort of your home’s interior. Doing this once or twice a week can even produce a noticeable impact in your Toronto home’s energy usage. While there are a number of foods that smell delicious when you’re cooking them, there are others that don’t always produce the greatest of odors, and the last place you want those odors lingering is inside your home. With a fully-functioning outdoor kitchen space, you no longer need to worry about those odors lingering inside your home. This can be a helpful benefit at all points during the year, whether you’re doing a fish fry during the summer, or you just don’t feel like having your home smell like a holiday dinner for days afterward.